War for the Planet of the Apes Review | Nerd Much? There have been a lot of blockbuster franchises and films released over the past decade, but one that seems to be consistently forgotten is The Planet of the Apes series. While it may not have the mass fan appeal like a Marvel movie possess, each entry has delivered not only fantastic action, but a compelling, character driven story. Enter War for the Planet of the Apes, the final entry in this science fiction trilogy that seeks to wrap up all of the various character and story plot holes present in the previous two movies. 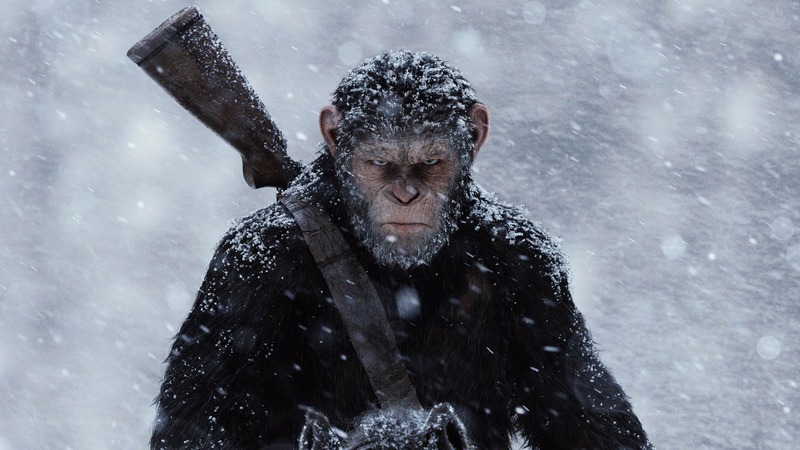 Thankfully, War for the Planet of the Apes not only succeeds in delivering a satisfying conclusion, but ends up being one of the best science fiction films of the decade. 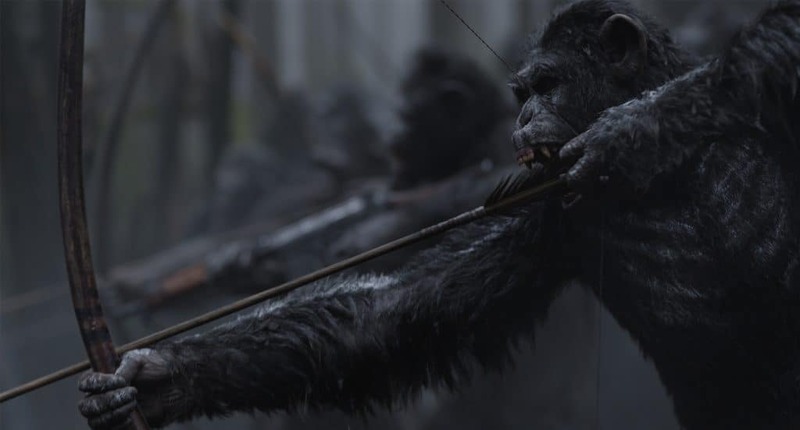 Set a few years after the events of Dawn of the Planet of the Apes, Caesar (Andy Serkis) and his apes are currently enthralled in a war with the humans for survival. Despite their best efforts to remain neutral, a militant human faction led by The Colonel (Woody Harrelson) launches a covert strike that ends up crippling the apes. Left with no other option, Caesar and a small band of loyal followers head north to stop The Colonel and potentially save his people from death. Along the way, Caeser meets an abandoned unnamed human girl (Amiah Miller) and a lost chimpanzee known as Bad Ape (Steve Zahn) who agree to help him take down The Colonel’s army. For the sake of not spoiling anything, rest assured there is a lot more complexity and nuance to this story than that basic overview. Where War for the Planet of the Apes succeeds is how laser focused it feels despite trying to tell a rather grandiose tale. Director Matt Reeves wisely lets the characters have breathing room and not get consumed by the action or events that are taking place. People like The Colonel could have easily fallen into tiresome cliches, yet this slower, more deliberate style allows Reeves to flesh this villain out. Everyone’s motives feel relatable and downright understandable, as both are trying desperately to survive. There’s a lot of emotional weight placed on the main cast and by the end of the movie you may find yourself shedding a tear or two. Much of this is thanks to the stellar acting and voice work, with Serkis and Harrelson absolutely being the standouts of this movie. It’s incredible to see how much Serkis rings out for a character that is largely just CGI elements. Caesar is tormented, sympathetic, vicious, and is perhaps one of the most human characters to release this year. He is simply not just a stoic leader, but one who is burdened by all of the tough choices he has made and lives with. Serkis delivers an amazing performance here, undoubtedly topping all of his other roles to the point where we are drifting into Oscar nomination territory. On the flip side, Harrelson offers up an exceptionally memorable antagonist. Despite clearly being inspired by 1800’s slave owners and Nazi propaganda, Harrelson manages to keep this villain rather grounded. Once you learn his reasonings for being so cold, it makes it hard to utterly despise him. This is a broken man who is willing to do anything to preserve the human race, which given the extreme circumstances is quite believable. While his conclusion is a bit underwhelming, many of the movie’s high points come from his interaction with Caesar and the other apes. Make no mistake though, War for the Planet of the Apes is very much a film not only about race relations, but forced servitude. It may come as a surprise to many that there is no big ape vs human battles, as this is very much a prisoner of war story. 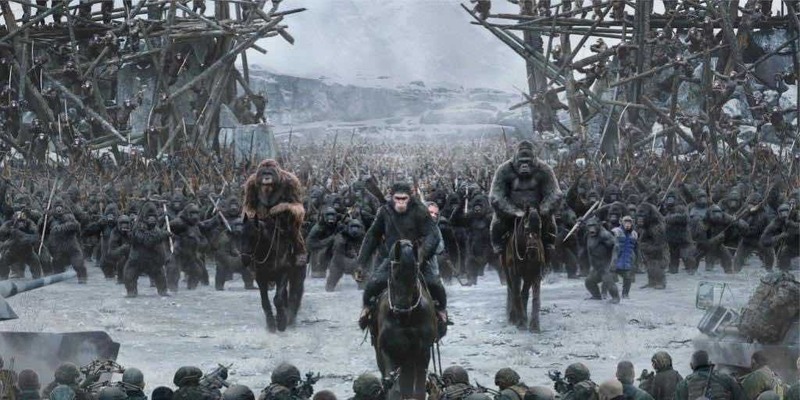 In line more with a Holocaust or slavery setting, this prison direction shifts War for the Planet of the Apes from a mindless action film into a more compelling drama. That’s not to say there aren’t battle scenes, but they are far fewer than one might expect. Reeves clearly wanted to make a more emotional film and the use of apes an allegory for any oppressed group is masterful. However, the themes can get a bit heavy handed from time to time, as the film doesn’t seem to truly trust its audience to work out the more complex ideas going on. Yet the story is all doom and gloom, especially since Steve Zahn delivers some hilarious moments as Bad Ape. There’s tragedy behind the character for sure, but Zahn has nearly perfect comedic timing with his jokes that help alleviate the oppressive nature of the movie. 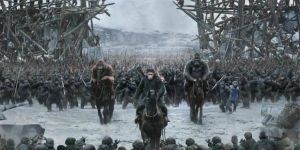 War for the Planet of the Apes biggest issue is it tends to drag around the mid section and the big climax feels a bit contrived. You can tell Reeves was running out of time and needed to rush the final 20 minutes of the film. Compared to how slow and methodical the rest of the movie feels, this sped up final act is quite noticeable. War for the Planet of the Apes is one of the best conclusions to a trilogy in years. Not only does it wrap up all of the main and side characters, but ends up telling a compelling story that hits nearly every emotional beats. Even with its heavy handed themes and rushed third act, the amazing and fleshed out characters will keep you invested until the credits role. This is more than a film about humans vs apes, but one of survival and what it means to be different. While this may be a long time until we see this franchise again, War for the Planet of the Apes is a near masterpiece that will be remembered long past its release.